11 posts categorized "simply taiwan"
I don't have much knowledge of the Sung Chiang battle array (a form of martial performing arts) beyond what I observed the day I took these photos. 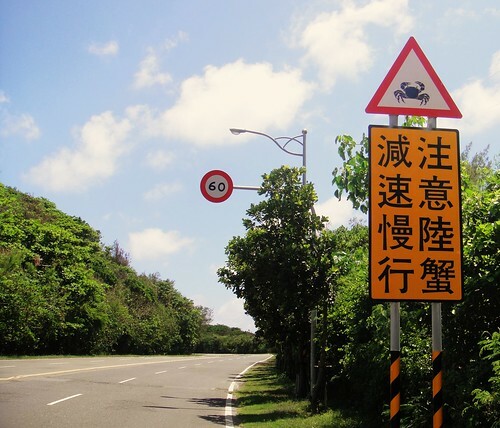 I took these photos not long after I moved to Taiwan and lived in Meinong in Kaohsiung County. 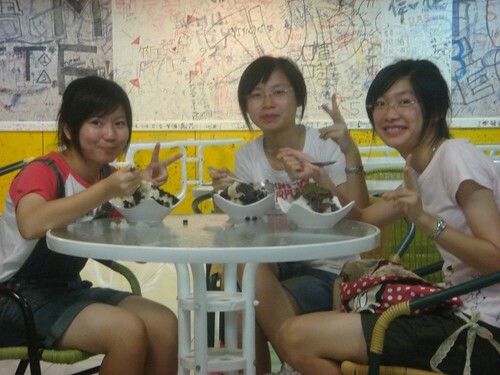 Two of my students invited me to a "fair" which turned out to be in reality a temple activity. They had taken me to the annual Goddess GuanYing Festival at the Neimen Zihjhu Temple in Neimen, a city north of our school. Neimen has reportedly around forty or fifty different battle array "troupes." Several different troupes performed one right after another. Each troupe had weapons and preformed to beating drums and gongs. Some troupes had young and old alike all performing; some didn't include children. Nearly all the performers were male. 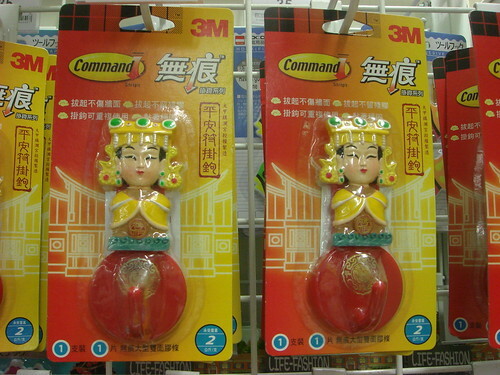 "Unlike many other traditional Taiwanese folk arts, the Sung Chiang battle array has never been recorded as existing in mainland China; it is purely Taiwanese." "Many of the weapons used in the Sung Chiang battle array are actually farm tools--rakes, sickles, hooks, umbrellas--used by the early peasantry." 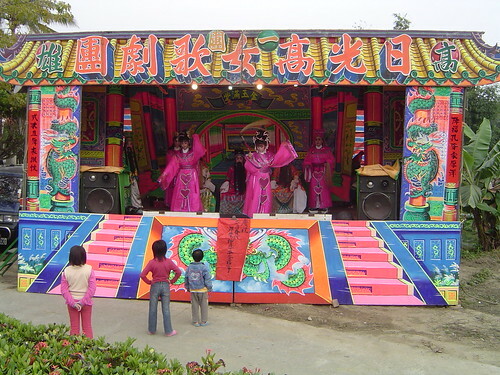 "The performances declined during the Japanese occupation of Taiwan (1895-1945) and today they are seen only during festivals, especially the birthday celebrations for Matsu (Goddess of the Sea), Emperor Paosheng (God of Medicine), and Cheng Huang (City God)." "A full-size Sung Chiang team has 108 members; smaller ones have 72 or, at a minimum, 36." "The performances vary but all include the same tactics, which add up to a total of 108." 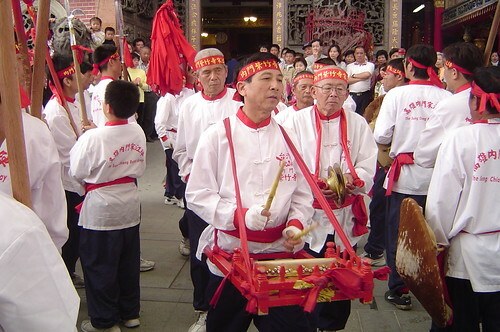 "All team members must pray to Sung Chiang before a performance starts; and, at both the beginning and end of a performance, the performers gather at the temple gate (most often, performances take place in temple courtyards), raise their weapons high, and shout 'Ho! Ho! Ho!'" The video below is of the troupe worshiping after performing. They start by worshiping the idol in the center, then move to the right and then to the left to worship the idols to the right and left of the center god. 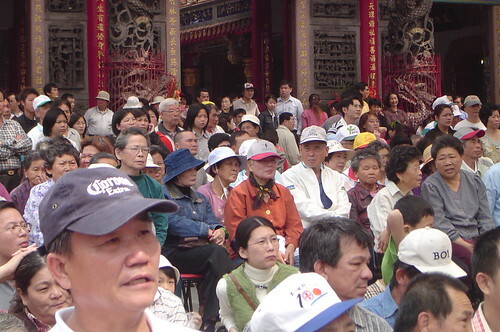 Many Taiwanese worship a variety of Buddhist, Taoist, and folk deities. 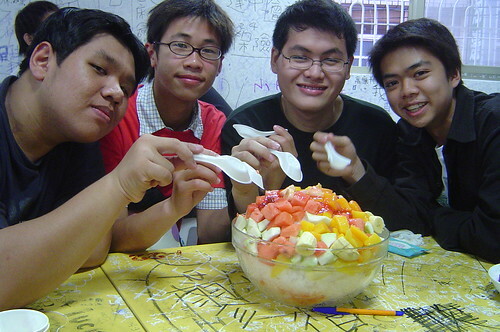 One of the ways Taiwanese people use to celebrate a god's birthday is a presentation of some sort to entertain the idols. I've seen people showing god's live "opera like" drama performances, demonstrations of "the art of war," movies shown on screens stretched between poles, women scantly clad singing and dancing, and puppet shows. Recently, I also saw a mechanical version of what is shown in the very short video below. Actually, there were five different mechanical stages set up around a traffic circle. Sometimes there is a human audience watching as well and sometimes not. 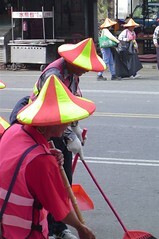 And, these guys below who are cleaning the street . . . 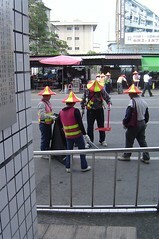 I just love that their pointy hats are covered in bight-can't-be-missed reflective material! Classic! 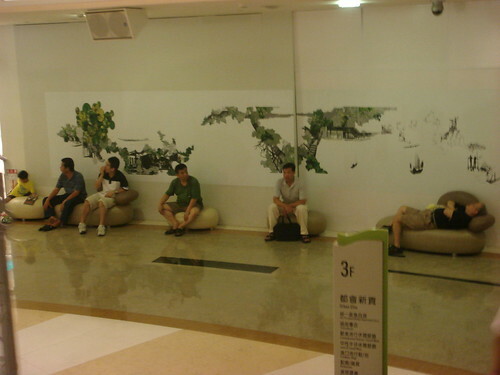 Some things--like men waiting at a shopping mall or women giving "the look"--seem to be universal and transcend culture. 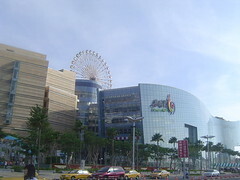 Dream Mall (夢時代) is one of the largest malls in Asia--and opened about a year ago. It is HUGE!! And, there is even a Hello Kitty ferris wheel on top of the mall. Including the "roof" (where the ferris wheel is) and the two basement levels, this mall has 12 floors in all! Malls--as we know them in America--are not common here in Taiwan. Instead there are "department stores." So, Dream Mall is actually very special. 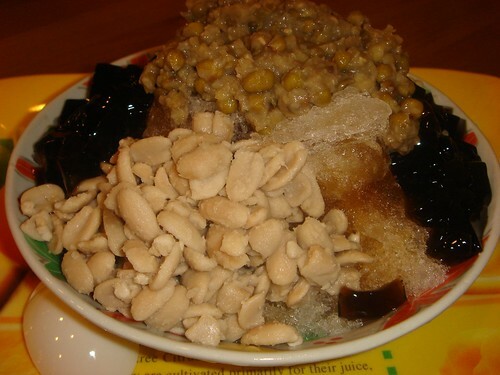 There are very few things I don't like about Taiwan. But, I seriously hate tossing the trash in Taiwan (and I consider hate a very strong word, so I'm not using it lightly here). At different times though out the day a trash truck will drive through every neighborhood. Each trash truck announces their presence by playing an electronic version of Beethoven’s “Fur Elise," which to the unknowing American sounds like an ice cream truck. 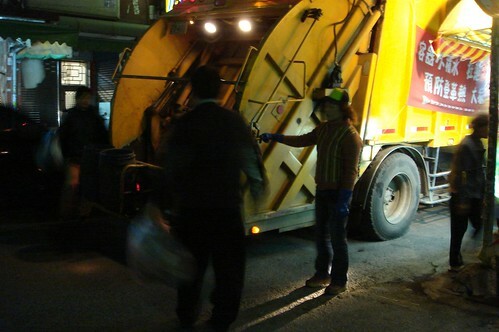 Each neighborhood/city is a little different, but each has their own trash truck traditions. At my old house, people from two apartment complexes all gathered along the alley in front of the buildings, the trash truck stopped and literally about 100 people tossed trash into the back in about 5-10 minutes each night. We all knew that the truck would arrive at about 7:30, so at about 7:20ish people started heading downstairs and gathering out front to wait. I, however, lived on the 2nd floor near the front entrance, so I would wait till I heard the tinny melody to grab my trash and head out the door. The nice thing about that neighborhood was that about 30 minutes later another truck drove down a side street, so if I missed the 7:30 trash truck, I could meet the 8:00 trash truck. Now, the 8:00 trash truck didn't stand still. People would stand outside their "townhouse-like" homes with their trash, and as the truck slowly drove by they would toss in their trash. This phenomenon is something that can't be captured by words and photos alone, a video is necessary to help you experience this. So, without further adieu, here is a trash truck I got stuck behind while on my moped one night. I always wondered what in the world I would do if I always worked nights and could never be home to take out the trash between 7:30 and 8:00. In some neighborhoods, the trash truck comes during the day . . . and I do wonder what people who don't work from home do about their garbage. Hmmm . . .
Ok, now let me just take a second to further justify my hatred for tossing trash. It is not just that I have to be responsible for taking out my trash and tossing it myself. That's ok. But is the fear that I've done something wrong and will have to dig in the trash to undo my mistake. You see, they have strict mandatory recycling polices here. And, if you throw out something that should be recycled, the garbage guys (aka trash nazis) will tear open your bag, and make you take care of it the right way. Once, right after my neighborhood started to recycle food scraps, I included egg shells in my food waste pile. I thought egg shells were supposed to be good for compost piles. Except, I later learned food scraps collected on the back of the trash trucks in blue barrels are not for composting but for feeding pigs. So, when the trash nazi saw my egg shells in the blue barrel, he made me dig through the pile of food scraps to remove them. All the while, people were tossing their garbage bags over my shoulder as I diligently stuck my hand into that disgusting mess of pig slop and dug out all the egg shells big enough to see with a naked eye. YUCK! Recycling trucks tag along behind trash trucks on certain days of the week--playing a different song (yes, at the same time). But, that's a story for another day. For now, here are four more Taiwanese trash truck videos I found online. Enjoy!!! Here is a link to a one minute video that is pretty good but can't be embedded. 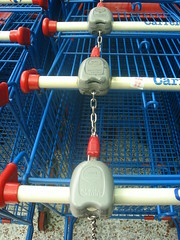 In order to keep carts on supermarket grounds, they are chained together. 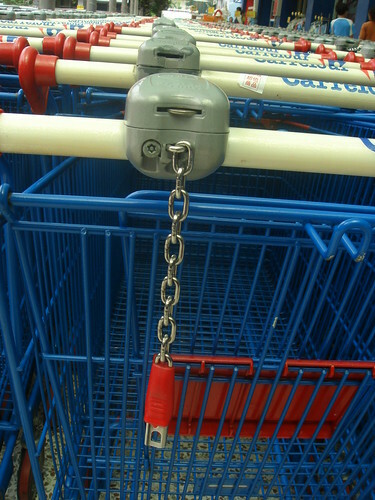 To use one, you need to insert a 10NT coin (a coin about the size of a quarter worth about 33 US cents) into the gray device and then the red part of the chain unlocks and lets you pull the cart away. When you are done using the shopping cart, you can return it to any location that has another "red handle device." Once you plug the red thing back into the gray thing, your money is returned to you. I suppose this also helps to discourage shopping carts from being left abandoned throughout the parking lot. This is the nicest "squatty potty" I've ever seen. 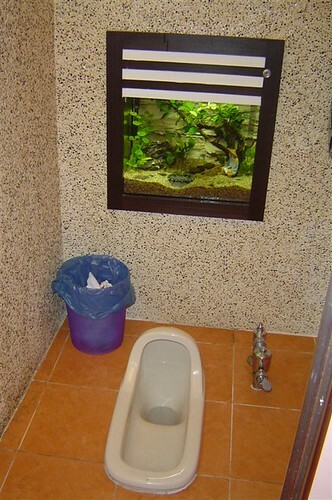 It has a fish tank at eye level once you are squatting! Yes, there were live fish swimming around inside!! Some homes have squatty potties, but mostly homes are equipped with western style toilets. However, when out in public you are most likely to encounter squatty potties--like the ones below. The one from the left is from McDonald's and the one of the right is most likely from a train station. To flush a squatty potty you will either step on something--like the photo above and the photo below to the right. Or, there is something to pull that will be hanging from the tank somewhere on the wall above the squatty potty. Oh, yeah, and most places would prefer you put your toilet paper in the trash can rather than flush it. And, just in case you are wondering, there is a front and a back--the "hooded" part is the front. 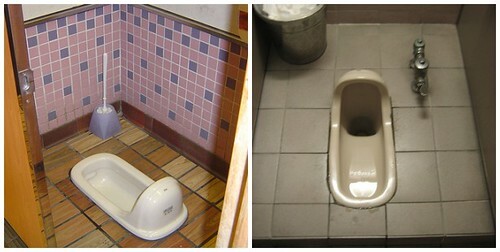 Now, you might be able to find a western style toilet out in public . . . but, beware, people will stand to squat on these too. So, just be careful before you choose to sit. Something new for following an unknown path is about to start . . .and I need your help. 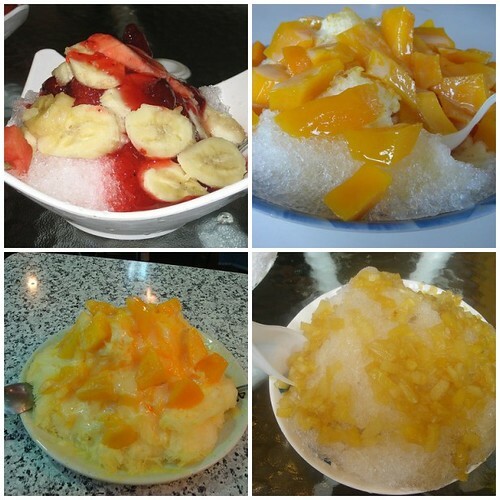 Recently, I've been uploading my older photos onto my flickr account. Photos I took before I had a blog, and so have gone largely unseen by others besides myself. Also, life here is getting a little more busy--it always is a little more hectic at the end of the semester than at the beginning. In other words I have no time to compose thoughtful, relevant posts. But, I'd like your help. What are some things you'd like to see photos of? 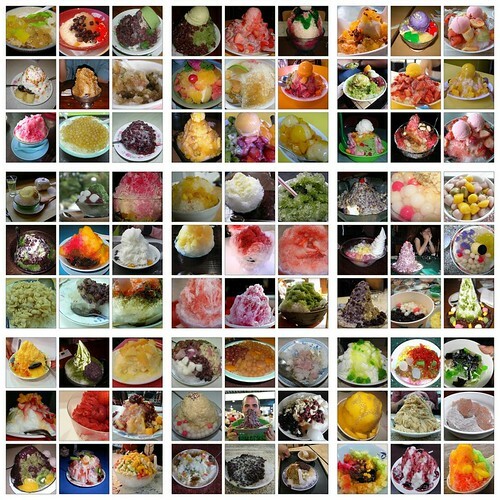 So, you wanna see food? bathrooms? public phones? mail boxes? people? temples? flowers? landscapes? You name it or ask about it, and I'll search my photo archives, and if I don't have a photo of it already--I'll see if I can take one just for you. :) Be as specific or as general as you'd like. 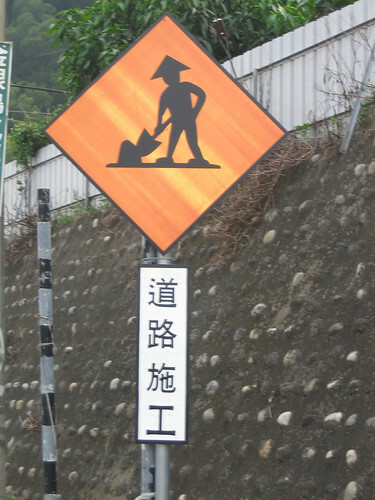 The other thing I'd like to do is answer questions you might have about life here in Taiwan. Awhile back, Deborah, from Cup of Joy, interviewed me for her March missions month, and I really enjoyed answering her questions. It allowed me to talk about things that are close to my heart but that I don't think about mentioning anymore because they seem so common place now. So . 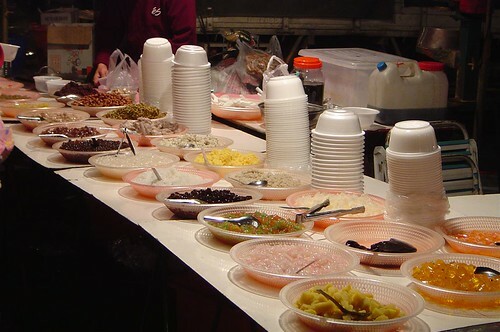 . . what would you like to know about life in Taiwan? Ask away, and I'll try to answer.